We’re going to Ecuador, one of the world’s most ecologically and culturally diverse countries, for an explosive adventure of volcanic proportions. Over the course of two exciting weeks, we will visit the UNESCO World Heritage City of Quito, climb four incredible volcanoes, stand at the farthest point from the center of the earth, soak in relaxing hot springs and take in the beauty of a remarkable country. The trip begins in Quito, Ecuador with a brief stop to satisfy your curiosity – don’t worry, you’ll have more time to explore after the climbs. We then move on to a serene hacienda outside of Otavalo, a town famous for its colorful market and close to many hikes that are a perfect warm-up for our more challenging climbs ahead. We start with a day hike around Guinea Pig Lake, named because it is shaped like a Guinea Pig (which is a must-try dish in Ecuador, might I add). Our first volcano climb is of the 15,750ft/4800m Imbabura. We complete the climb as a pleasant day hike and return to our hacienda for the night before moving down Volcano Alley to our next goal, Cayambe. As Ecuador’s 3rd highest peak, the glaciated 18,900ft/5790m summit of Cayambe lies directly on the equator! Before climbing, we will spend a day going over glacier travel and basic mountaineering skills to prepare us for the exciting climb. 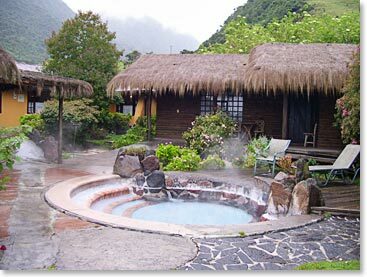 The serene hot springs where we stay on our rest day between climbs. Before continuing, we take a rest day at Termas Papallacta. Here we can soak in the lovely hot springs and recuperate some energy and strength for our next climb, Cotopaxi, Ecuador’s second highest peak at 19,350ft/5900m. This is perhaps the most well-known of the mountains we will climb due to its distinct symmetric appearance. 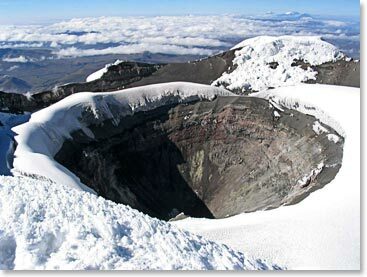 And finally, we will climb the big one, Ecuador’s highest volcano at 20,701ft/6310m, Chimborazo. 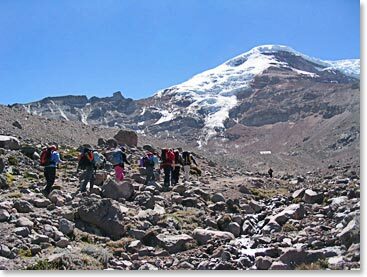 It is on the summit of Chimborazo that we will stand at the farthest point from the center of the earth. Due to the bulge of the Earth’s surface around its middle, Chimborazo actually stands over 7000ft/2130m farther from the center of the Earth than the summit of Everest! Hiking to the high camp hut on Ecuador’s highest mountain, Chimborazo. Contact us to sign up or to get more information. You can also visit the Ecaudor’s Volcanoes page on our http://www.bergadventures.com/v3_trips/south-america/ecuador-description.php.